Family members say 23-year-old Jassy Correia was found dead in the trunk of a car in Delaware after her alleged kidnapper was taken into custody. Family members say the body of a Massachusetts woman who was last seen at a Boston nightclub on Saturday night has been found in the trunk of a car in Delaware, where her alleged kidnapper was captured on Thursday. "We received some devastating news today and Jassy is no longer with us," Katia Depina, the cousin of Jassy Correia said on Thursday night. A Rhode Island man wanted in connection with the kidnapping of 23-year-old Jassy Correia of Lynn was taken into custody Thursday in Delaware, according to law enforcement sources. Boston Police said a body had been recovered and they were awaiting positive identification. Thirty-two-year-old Providence resident Louis D. Coleman III had been wanted in connection with the kidnapping of Correia. 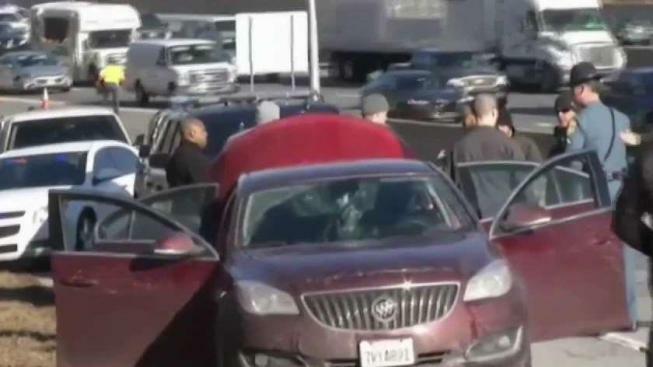 Providence Police said that Coleman was apprehended in Delaware and that a body was found in the trunk of his vehicle. Earlier in the day, Joel Correia told NBC10 Boston that his sister Jassy was dead. Depina said she received news from police on Thursday that the body was identified as Correia. "She was a mother, she was brave, she was strong. She did not deserve this. She went out to celebrate her birthday and never returned home. She did not deserve this," she said. "We want justice for her death." "Women should have the right to go to any nightclub and wear what they want and not worry about being kidnapped and murdered at the end of their night," said family friend Joao Depina. Family and friends say they've never heard of Coleman and don't think Correia knew him, either. Authorities said Coleman had previously been seen in the Providence area on Thursday. A search warrant was conducted at his Chestnut Street apartment, but Providence Police Chief Hugh Clements said he could not give details on what was found. Clements said the case was being treated as a homicide investigation. He said police in Providence and Boston are investigating in collaboration with the Rhode Island Attorney General's Office and the U.S. Attorney General's Office, as well as local offices of the FBI. "We don't know right now whether it will be Boston, Providence or a federal agency who eventually takes the case," Clements said. Correia, the mother of a 2-year-old girl, told her family she was going out on Saturday night and didn't respond to messages on Sunday, Monday or Tuesday, which is when her family began to fear the worst. She was last seen leaving Venu Nightclub in Boston just after midnight on Sunday, getting into a red car with a man, believed to be Coleman, near Tremont Street and Herald Street. The family could not reach her on her birthday on Tuesday, and she was reported missing Wednesday.